'Pineapple Express' Pounds West Coast, Causing Floods, Power Outages : The Two-Way The region is expected to get rain through Friday. Meteorologists say this is the biggest storm the region has experienced since 2009. Twitter users dubbed it #hellastorm. 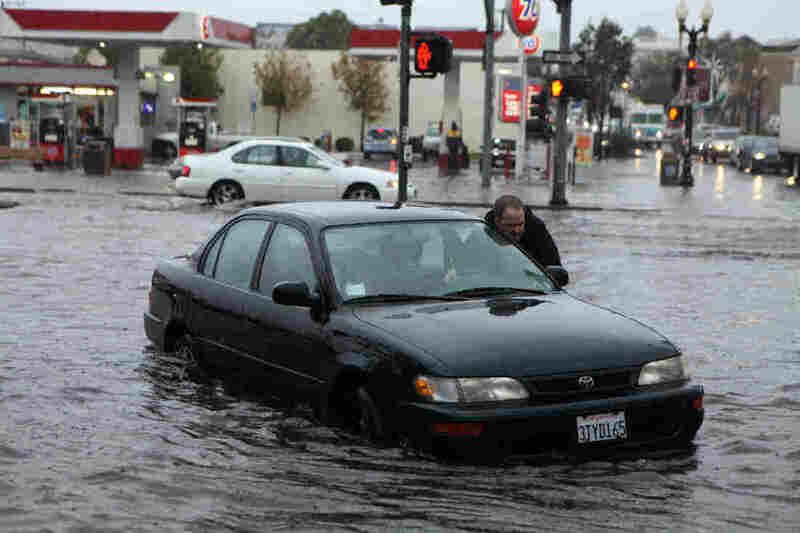 Mark Kunze of San Bruno pushes his stalled vehicle out of a flooded intersection Thursday in South San Francisco. The "Pineapple Express" is being blamed for two deaths in Oregon this morning, as it continues to dump wind and rain across the drought-stricken region. The Associated Press reports that from Oregon all the way to Southern California, residents battled with power outages, flooded roads and mudslides. "Avalanches of mud and debris blocked part of the Pacific Coast Highway in Ventura County early Friday, National Weather Service specialist Stuart Seto said. "He said that heavy rain was falling in Ventura County as well as western Los Angeles County, where possible flash flooding was a concern." Talking to our Newscast unit early this morning, KPCC's Jacob Margolis said it was raining hard in Los Angeles. He said trees have fallen on cars and fears of mudslides have triggered evacuations. The rain, he said, is expected to continue through Friday. "One spot in the Santa Lucias — the mountain range rising high above the Big Sur coast — had 2.84 inches in one hour and 1.56 inches the next. Arithmetic: 4.40 inches in two hours. "For comparison, San Francisco has recorded 3.21 inches of rain for the day through 10 p.m. [local time]. If I'm reading the weather records right, that makes it one of the five rainiest December days in the city's weather history going back to 1849. And down there in the Santa Lucias, almost that much fell in just 60 minutes. It's a little challenging to imagine the intensity, or the result in terms of runoff." Remember, the area is in the middle of a historic drought, so rain is welcome — and such an exhilarating sight that it spawned its own hashtag on Twitter: #hellastorm.